Philly Life & Culture has been invited to community theatre events in the past and we elected not to attend. As editor, I’ve been at an impasse as to whether or not community theatre should be critiqued and even if those inside the community are prepared to here constructive criticism. There are several publications that I feel overlook things within a community theatre production for fear of hurting feelings. So, when asked to review Footlighters Theater production of Jason Robert Brown’s parade, I immediately turned down the invitation. After a lengthy conversation with the show’s director Melody Dougherty, also a theatre critic, we decided this would be Philly Life & Culture’s first piece. Already in it’s second of three weekends, Footlighters Theater ambitiously and successfully mounts this Jason Robert Brown classic. It feels like a JRB week for me having just seen The Last 5 Years for the first time, as well as meeting the artist in person while attending his wife’s production of Big Red Sun at 11th Hour Theatre. Parade was another JRB first for me. It’s not a score that has made it’s rotation on my Spotify but I am very aware of its theatrical impact on my peers. It is quite a feat to produce such a vocally and culturally charged piece in the community theatre world. There are just a few community theatres in the region that I think would even be able to pull it off and Footlighters was not on the grid. However, it is clear by the playbill that Melody Dougherty was on a mission. Not only did she serve as director, but she also acted as set designer, light designer, sound designer, as well as stage crew. She did have a team working with her on sound and lights so she wasn’t fully alone. However, I do think it was a tall order to fulfill all the roles as was evident in this production of Parade. Kristina Psitos as Lucille Frank exemplifies a progressive women in Deep South Georgia. The character stands by her man, yet doesn’t let the man dictate her thoughts or boundaries. Psitos delivers her strength with nuanced expressions and the vocal prowess of a professional. Playing 13 year old Mary Phagan was Sophie Gourmand (double cast role). Having not known the show, but having met Gourmand’s character, I was sad to see her “go” so soon from the show. She is a spitfire on stage and reminds me of an older Daisy Egan. Perhaps Footlighters will produce The Secret Garden so Gourmand can sing her heart out as Mary Lennox. Frankie Epps sings his heart out as Robert Lewis, local charmer who hits on all the factory girls but hearts lies with Mary Phagan. Ameer Dunn as Newt Lee and Anthony “Toney” Harris as Jim Conley, both persons of color who gripped the anguish of slavery and targets of blame for crimes just because of color. They were expertly cast as their voices were powerful and their presence was soul searching. The 1913 costumes and designed by Mary Reynolds were well constructed and beautifully executed. Often times, community theatres will just dress an actor. Reynolds put careful thought into color, style, texture to deliver the overall time and tone of Parade. As ambitious as this production was and even with stellar acting by the entire ensemble, arguably the best I have ever seen in community theatre, there were also some big misses. Lighting and Sound Design were a huge disappointment. When I say that no faces were lit downstage at any time, I am not exaggerating. The opening scene with a Young Soldier (Robert Lewis) singing downstage center, the entire song his torso to the floor was in bright white and the rest of him was in sheer darkness. This transpired during the entire show whether center, right, or left. It is clear that Footlighters does not have the lighting technology to both light all the faces as well as create mood. The lighting team elected for mood yet it distracted from the story. The sound was no different. Body mics in the community theatre realm are a luxury indeed. However, the operating of them truly takes a professional or someone who truly has studied sound. The imbalance of each actor, the feedback, the gain levels, and the severe cutting out of lead character Leo Frank, made it challenging to follow plotlines. In such a small space, it really would have served better to just eliminate microphones, unplug the orchestra, and just sing the story without electrics and in full light. Parade is a lengthy show. It ran 2:45 with an intermission. Some of that time could have been relieved with reducing some of the lengthy scene changes or modifying some of the furniture/set pieces that were coming and going on such a tiny stage. The set design was well suited for the show with confederate art work at every turn; however there was a glaring distraction. There was an update platform above the onstage orchestra which served as an additional acting space. However, you couldn’t see anyone’s face that was standing up there. Not because of the lighting issue, but because there was a giant black curtain hung in front of them. I’m assuming the curtains were hiding some sort of bars or electric, but with half a dozen scenes being played on that platform, it became silly that it was noticed by the production team to correct it. Another addition to the set was the use of live video and projections. The idea is good in theory but as executed fell flat. There were two screens high above the stage proscenium and the videos were often brighter than the stage action so we were pulled away from the story. The use of live video was to emulate the scene from behind the actors on stage, however what was being viewed was a direct live video of the stage management booth and the feed was a second or two delayed. Cool in theory, but did not work here. I would also add that the team in the lighting booth was talking at full volume, even laughing at times throughout the show which caused snickers with the audience around me. 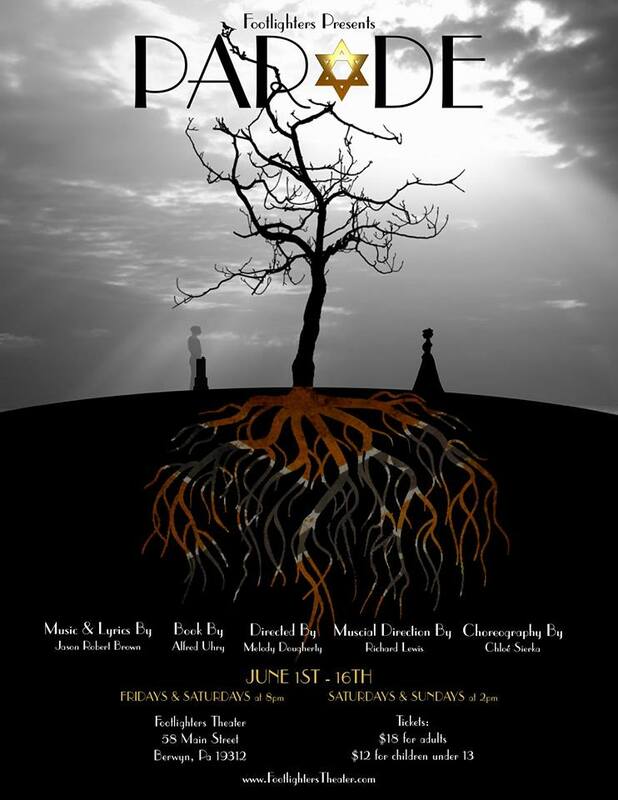 Parade is a tall order for any theatre, but in spite of the glaring flaws, the acting and staging was well done. It is clear that Dougherty was determined to up the ante in community theatre and I am glad she did. It does take a village. Just wish that village has more tricks up their sleeve and that one person didn’t have to produce her whole show alone. Was the direction good? Yes. Was the acting good? Yes, it was great! Was the singing good? Even with volume concerns, they were singing their hearts out! The point of community theatre is to bring people together who live ordinary lives but have a love of the art form. It’s not often great but I do believe it is meant to do its very best with the tools you are provided. Here, the cast was stellar, the story was effectively told, and it did seem that the ensemble had a community vibe. THAT is what matters. Parade returns tonight at 8pm and tomorrow at 2pm and closes next weekend. Visit there website for details!